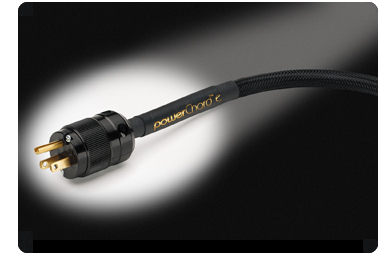 The forte f3 powerChord is an entry level priced high performance powerChord. Over 20 years of Audience high performance powerChord DNA technology is embedded in the forte f3. The forte f3 powerChord provides end users with an extremely affordable product with unbeatable performance, far beyond its price range. The forte f3 powerChord is a high current 10 AWG design made with high purity stranded copper wire so it is flexible and user friendly. It’s geometry is a proprietary design that rejects noise while balancing energy flow for lowest eddy current resistance. The brass contacts have been cryogenically treated at the Audience cryogenic laboratory. No other component engenders more controversy than aftermarket power cords. Traditionalists will often wonder what difference a power cord can make when the electricity has traveled through miles of electric lines to get to your wall outlet. The real question to be asked is, “what kind of damage does your audio component sustain by using a standard small gauge power cord?” The answer to that question is, “plenty”. By their very design, stock power cords impede transients, radiate electromagnetic noise and resist the smooth flow of electricity between the component and the electrical source. More often than not, they are “reactive” meaning that their design introduces capacitance, inductance and resistance into the electron flow which will compromise the interface between the component and the power source. In addition, they often act as antennas in their ability to attract radio frequencies. As one can see, the innocuous looking power cord can introduce major distortion in an audio system. Another way to look at the power cord is to reverse the traditional view. Rather than the last few feet in a long line of power delivery, the power cord is the first few feet of your component’s primary transformer winding. Viewed this way, the power cord assumes an all-important and essential part in preserving the performance or your system. Audience power cords eliminate the damaging choke point that is represented by the stock power cord. Not all electronic phenomena are understood by conventional science or revealed through existing test procedures. The superior sonic enhancement of a good high performance audio/video power cord is no exception. While aftermarket power cords are a most controversial subject, the improvements they offer are also the most easily demonstrated. In many systems going from a stock power cord to a high quality cord designed for audio/video playback can be nothing short of transformational. Reviews for forte f3 powerChord here.